Impatiens, it lacks the flair of the petunia. It's not as assertive as the marigold, nor as earthy as a begonia. Yet it has increased in popularity every season for the past five years, and it's now tops in bedding plant sales in the U.S., with growers' revenues exceeding $250,000,000 a year. It is the unassuming but cheerful impatiens. Small wonder it's number one. Unashamedly floriferous, its blossoms come in nearly as wide a range of colors and shapes as the orchid, according to Christopher Grey-Wilson, author of The Impatiens of Africa. And it has the good manners to drop its faded petals. No deadheading needed. Impatiens flowers from May to November, and plants continue to increase in size. I have seen an impatiens plant standing 3 1/2 feet tall and equally wide in a pot on a shady patio. 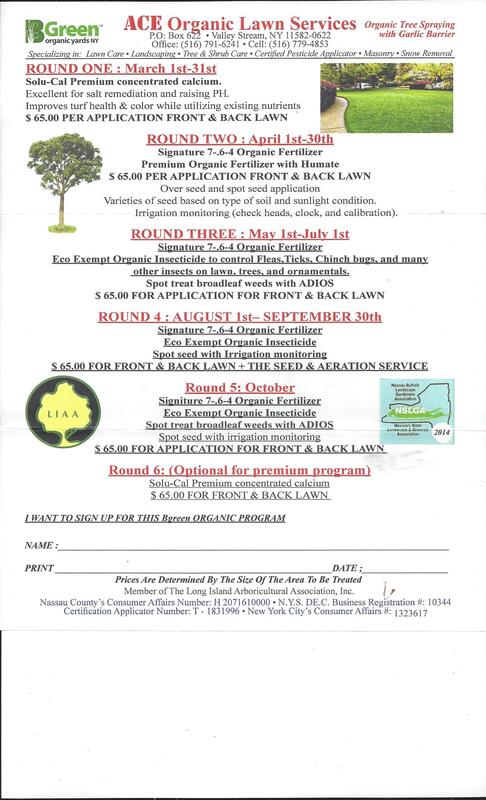 Yet impatiens needs little fertilizer. It's resistant to almost all diseases and shrugs off insects, although the New Guinea impatiens is susceptible to whiteflies and red spider mites. This versatile plant serves the gardener well in beds and borders. It drapes nicely from hanging baskets and makes a fine display in containers. All like continuous shade or at least filtered light, but New Guineas will take full sun for a couple of hours in the morning if soil moisture level is kept high. Too much sun will produce heavy foliage and fewer flowers. 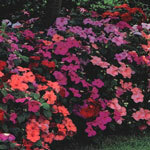 Impatiens benefits from a balanced fertilizer but it should be used sparingly: Too much nitrogen will encourage lush foliage and prevent best flower formation. Starting from seed is tricky. 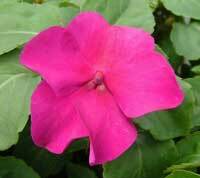 For one thing, impatiens seeds are very small; there are about 46,000 in a half-teaspoon. 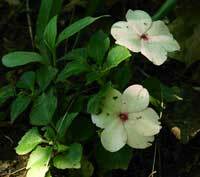 Also, impatiens seed loses its vigor rapidly, surviving for two years at most, even under ideal conditions. To start impatiens seeds, press them into the surface of a sterile potting mix about seven weeks before the last frost and don't cover -- impatiens needs light to germinate. Aft a couple of days, cover the seeds lightly with potting soil and shut out all light. When leaves emerge, move the tray back into the light. Temperature at first should be about 75 o F. Mist pots or trays intermittently until true leaves emerge. Germination takes about two weeks. Grow on at 72 o F during the days, and 62 o F at night. Water plants from the garden center before you remove them from the container. Dig planting holes that are twice the size of the rootball and plant at the depth at which they grew in the container. After planting, water thoroughly. We advise pinching out mature flowers and seedpods if you want to push the plants and keep them blooming longer. Also, pinch balsams back to one stem.